Mass appeal: Raise your hand if you like Altar Boyz. Photo by Carol Rosegg. 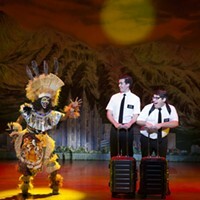 When Kevin Del Aguila (book) and Gary Adler & Michael Patrick Walker (music and lyrics) were writing their off-Broadway smash Altar Boyz, it's unlikely they asked, "Yeah, it's funny ... but will it play in Pittsburgh?" Now that the show's tour has landed at the Byham, we all have a chance to see the, ah, interesting, answer. 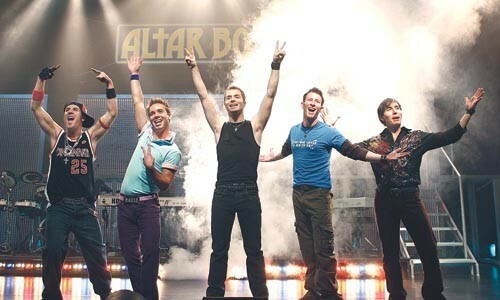 Altar Boyz is a quasi-parody of boy bands like *NSYNC and The Backstreet Boys, except that this is a Christian group. The band has left its Ohio home to travel around the country on its "Raise the Praise" tour, and the performance we see is the last before they pack it in. Altar Boyz plays out more as a concert than a show. 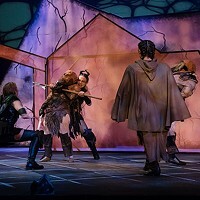 Adler & Walker's score, appropriately, is high-, high-, HIGH-energy music, and the cast of five pour just about every last bit of sweat into their performances. Each young man is a type: Matthew Buckner plays Matthew, the Justin Timberlake heart-throb; Jesse J.P. Johnson is the lunk-headed ex-stoner Luke; Jay Garcia plays Juan, the Mexican orphan adopted by the troupe; Ryan Strand is, inexplicably, the group's Jewish member, Abraham; and Ryan J. Ratliff is Mark, a young man whose gay sexuality is so obvious that nobody, especially Mark, seems to notice it. While Aguila's plot is, at best, serviceable, he's a very, very funny writer, and the gags are as fast-paced and successful as the songs. In the real world, it'd be impossible to watch this show without a huge smile plastered on your face from start to finish. But can Pittsburgh be described as the real world? While our fair city is no longer the Catholic bastion of old (at one time the nation's fourth-largest diocese), we still have Catholicism embedded in our DNA. That might explain the odd reception the show received the night I saw it. To be very clear, at no point is Altar Boyz an attack on religion. This bit of bubble gum is too sweet and good-natured to attack anything, except maybe a bad mood. But in its simpleminded way, Altar Boyz gently lampoons rote parroting of religious dogma, especially when such vapid sincerity confronts the innate megalomania all performers have burning in their guts. When the boys perhaps stray past the boundary of piety, it's funny because they're so caught up in "putting on a show" that they don't realize their own loopiness. 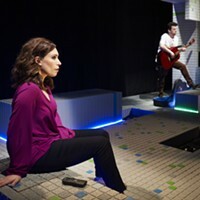 But on opening night you could feel, more than once, an actual wave of discomfort rippling through the Byham audience. The weirdest thing isn't that people were offended: It seemed to me that they were wondering if they ought to be offended. By evening's end, however, the crowd was finally won over, thanks in no small part to Christopher Gatelli's unbelievably brilliant choreography. But it was a long time getting there. Altar Boyz continues through Sun., May 6. Byham Theatre, 121 Sixth St., Downtown. 412-456-6666.